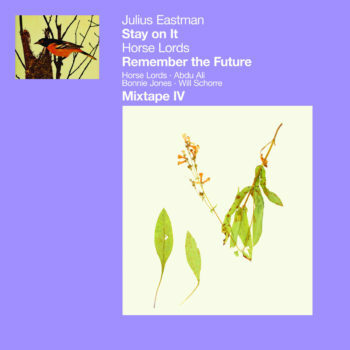 West African rhythms collide with just intonation guitars, art-fire saxophone, minimalist grooves, and collaged zapdowns on Interventions, the powerful third full-length from Baltimore’s Horse Lords. The band’s Northern Spy debut is also the first Horse Lords album to explore the classic studio-as-weaponry strategies of yore, mapping the quartet’s raw Baltimore lightning onto the experimental musique concrète territory surveyed by elder heads like Faust and This Heat. Founded at the turn o’ the ‘teens by Andrew Bernstein (saxophone/percussion), Max Eilbacher (bass/electronics), Owen Gardner (guitar), and Sam Haberman (drums), Horse Lords quickly established themselves as avant-heavies with the two extended tracks of their powerful self-titled debut (Ehse Records, 2012). 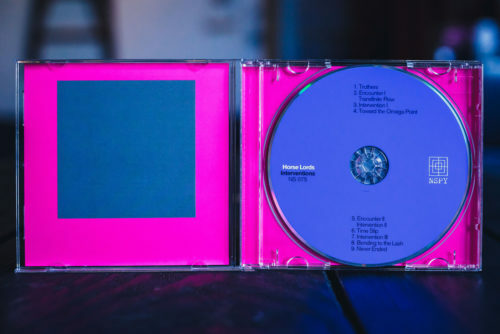 Playing custom electric guitars and basses refretted by Gardner, the band’s rolling polyrhythms chime with the strange and distinct harmonies of just intonation inspired by the master La Monte Young and other heroes. 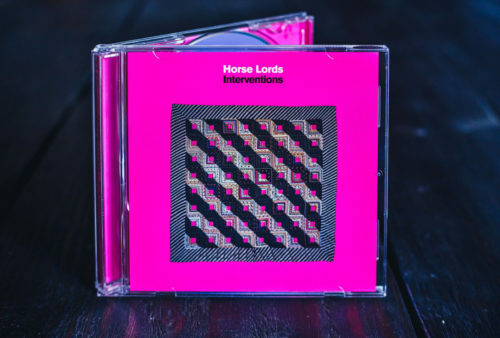 Where the earliest Horse Lords releases, also including Hidden Cities (NNA Tapes, 2014) concentrated on linear performance, a trio of Mixtape cassettes (self-released, 2012-2014) pointed the way towards the newest turn in the Horse Lords saga. Chopped and screwed and stomped and smothered and dissolving to bells and then suddenly (as if through a flung-open door) back into some room where Horse Lords is playing at full flight, the three Mixtapes exploded the possibilities of the quartet. Changing contexts like flipping channels on a dadaistic cable box, the series found a whole expanded universe of Horse Lords there for the squonking. Realizing that promise, Interventions is (as they say) a new phase Horse Lords album with Bernstein’s saxophone and the microtonal guitars pinging through the stereo mix with single-minded purpose. 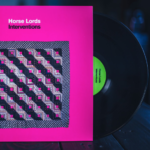 Horse Lords is a band, its members serving a range of functions over multiple axes, from the audible (writing and performing music) to the structural (altering their instruments), to the soundscape in between (editing together Interventions’ threaded mini-suites). 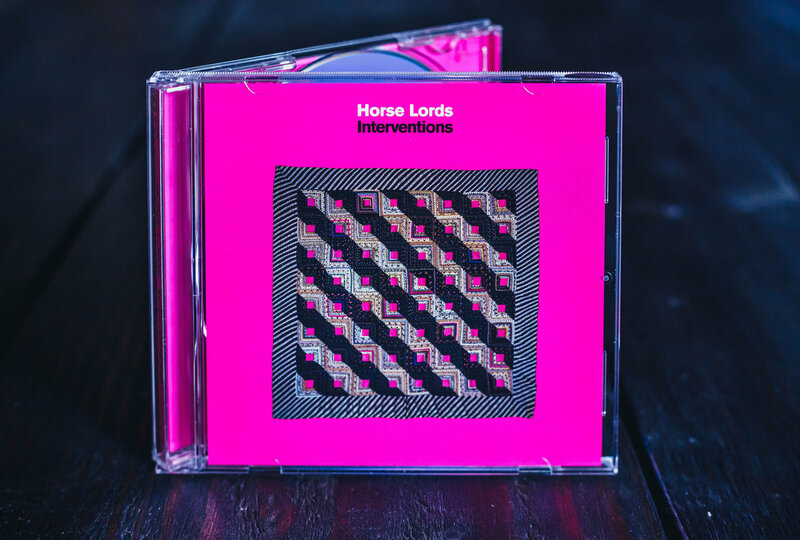 Part of the newest wave of smarty-arty-weirdos playing DIY spaces and tea houses and college campuses, Horse Lords’ soaring heaviness achieves a true poise that seems equally primed to make the leap to concert halls and festivals. Making appearances on freeform radio station WFMU and concert recording site NYCTaper, Horse Lords are recognized, too, as a galvanizing live act, powered by the double-drumming of Sam Haberman and Andrew Bernstein. 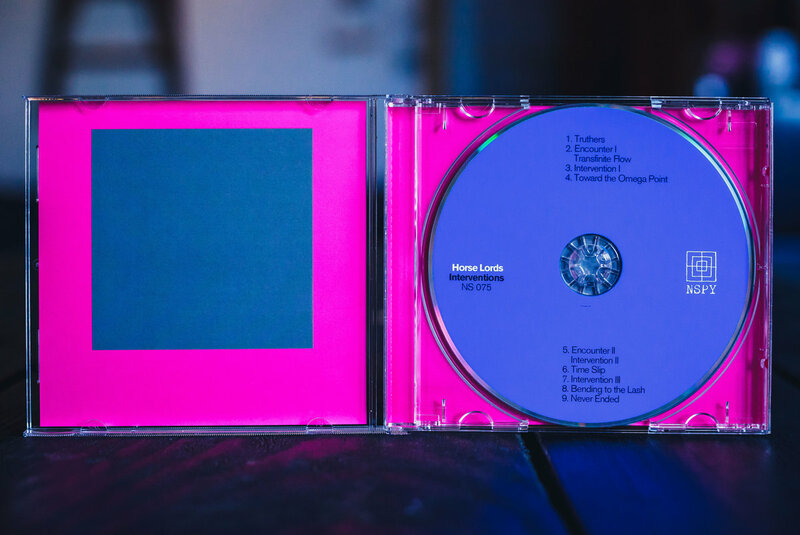 Last year, their Hidden Cities Remix to benefit the local Living Classrooms’ Believe in Music featured the work of influential contemporaries including fellow Baltimore undergroundists Drew Daniel and M.C. Schmidt of Matmos (contributing separately) and Guardian Alien drummer/lead-brain Greg Fox. 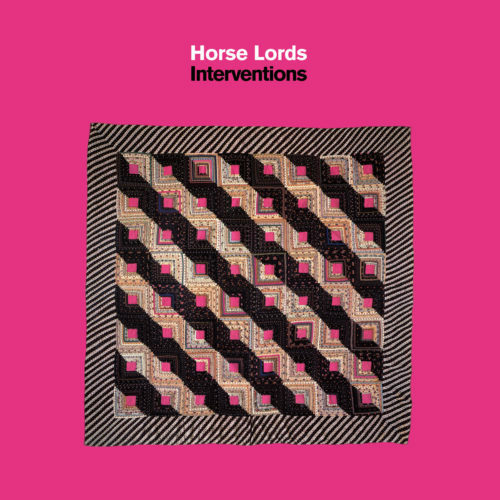 Floating at the boundaries of composition and improvisation, electronics and performance, the underground and the vast improbable 21st century indie mainstream, Horse Lords exist in none of these places and all of them. 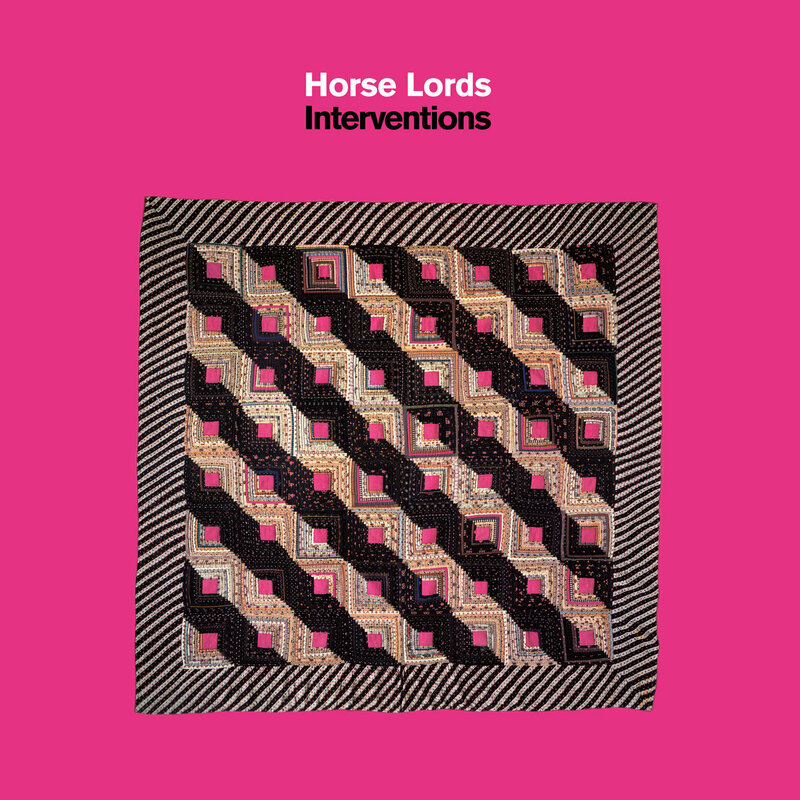 More accurately, they exist on Interventions, the album you now hold in your proverbial hands, perhaps noticing the reflection of the imaginary room’s light reflecting on the LP cover, ready to cue up as you find yourself in the new beyond of tomorrow’s ecstasies and today’s Horse Lords.